The Ryuukyuus are today known as Okinawa Prefecture. They are are string of islands stretching in an arc from Japan's Kyuushuu Island down toward Taiwan. Previous smaller kingdoms were unified into an independent kingdom by the Sho family in the early 1400's. The first locally made coin was the Taise Tsuuhou begun in 1454. 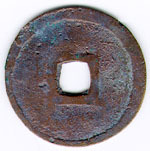 The next was the Setaka Tsuuhou, first minted in 1461. Despite the fact that the Ryuukyuu's were not a large kingdom, the number of these coins minted was quite large and they are not too uncommon. One other coin, the Kin'en Sehou (1470) is more hard to find. After this, local mintings of standard 1 mon coins seem to have stopped and Chinese coinage relied upon. In 1609 the Shimazu clan, rulers of the Kyuushuu domainal country of Satsuma, sent an army to conquer the Ryuukyus and took the king Sho Nei as hostage. The Tokugawa overlords away in Edo allowed the Shimazu clan to claim the Ryuukyuu's for their own as a subject kingdom. The Sho were returned and remained kings of the still relatively independent Ryuukyuus but were subject to taxation and indirect rule by the Shimazu house until the 1870's. At the same time the Ryuukyuus were treated as an independent periphery kingdom by the Ming, and later the Qing (Ch'ing) dynasty of China. Thus the Ryuukyuus had a very complex political identity between 1609 and 1879 when they were fully incorporated into the Japanese Meiji state, as Okinawa Prefecture. 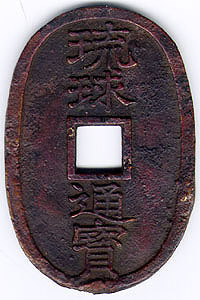 During the late Tokugawa and early Meiji period Satsuma domain, like many domains within Japan, wished to mint its own currency, and also to manufacture counterfeit 100 mon Tenpou Tsuuhou coins, in order to improve government finances. It achieved this partly by the cover of manufacturing coins for use within the Ryuukyuu kingdom. The 100 mon Ryuukyuu Tsuuhou (1863-) is very similar to the Tenpou Tsuuhou. 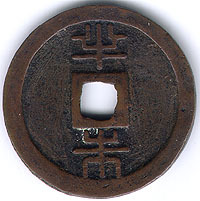 The Hanshu Ryuukyuu Tsuuyou (1863-) is large, round and not like any Japanese coin. The Setaka Tsuuhou pictured below on the left was minted during the reign of the king Sho Toku between 1461 and 1470. One fascinating thing about how this coin was made is that the manufacturer took the Chinese coin Yung Lo Tong Bao (J. Eiraku Tsuuhou), carved away the Yung Lo characters and replaced them with the Sekou characters. Notice how the Sekou (top and bottom) characters are rounded while the Tong Bao characters are angular. Also notice the curious left and right shifting of the Sekou characters relative to the center hole. The coin below was dug from the bottom of the Berantas river in Java, Indonesia. Mostly Chinese, but also Japanese, Annamese (Vietnam), Malayan and Ryuukyuuan coins are dug up there regularly. This is a testament to the international nature of cash coinage. This one seems to be nearly uncirculated and may have been sunk on its first trip from the Ryuukyuu's. A Yung Lo Tong Bao is pictured to the right for comparison. Because copper shrinks when it cools the Setaka Tsuuhou is a touch smaller than the standard Yung Lo Tong Bao which was used as the base of the "parent coin" in manufacture. The Yung Lo Tong Bao was produced in such quantities by the Ming for foreign consumption, and so many circulated in Japan that in the 16th century in Japan the word "Ei" (Ch. Yung) meant "copper money." 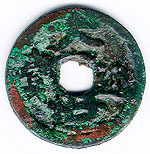 Taise Tsuuhou, "Missing Top Tsuu"
This coin was minted earlier than the Setaka above but used the same method. The Tsuu Hou characters are from the Yong Le coin and the Tai Se characters are added on. 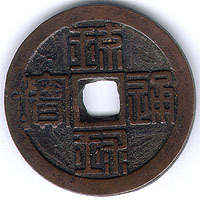 This variety has the top of the Tsuu character missing, probably accidentally cut off when carving out the Yong and Le characters to make the mother coin of this coin. It is a common and recognized variety, but not very handsome. I like the name hower. Taise means "Great World" and one senses the excitement of Ryuukyuu's maritime commercial empire which flourished at this time. This coin was found in Java. The 100 mon Ryuukyuu Tsuuhou pictured below was first manufactured in Kagoshima (Satsuma domain) 1863 for circulation within the Ryuukyuus and in Satsuma domain itself. 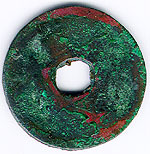 Like the Tenpou Tsuuhou upon which it was modeled, its face value was 100 mon but its weight was merely 6 to 7 times that of a 1 mon coin. Furthermore, even though the face value was 100 mon the Satsuma government ordered that it circulate at the value of 124 mon (go figure!). This made it a profitable coin to manufacture, but was not well received in circulation. 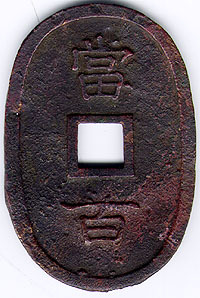 The round Hanshuu Ryuukyuu Tsuuhou was ordered to circulate at the value of 248 mon, or twice the value of the 100 mon coin. However it weighed merely 8 monme or about 10 to 12 times the weight of the average one mon coin. Han means "half" and "shu" is a gold currency weight. Therefore the Satsuma government was trying to command an exchange rate between copper currency and gold currency. Normally the relative exhange rates of silver, gold and copper currencies were unstable thoroughut Japan despite government attempts to decree them into one currency system. Thus although at one half shu this coin should have circulated at 32 coins per gold ryou (one koban coin), it is unlikely that it really did so. This coin is rather beat up as if it has survived a fire. The English bombarded and destroyed most of Kagoshima, the castle town of Satsuma, in August of 1863 in an attempt to extract an indemnity for an Englishman murdered by a Satsuma samurai in 1862. The mint which produced this coin was burnt in the ensuing fire. I wonder whether this coin were dug from the ruins. back is written Touhyaku or "worth 100"